The last time I posted something, almost an entire week ago, I was clearly a little rattled. It took one day to get back on track. Typical after I post about poor motivation, poor performance and the little doubts in the back of my mind! Thankfully the weekend and most of this week has bolstered the sense that maybe I can pull this race off! Great timing as officially I’m tapering. Having effectively wasted (my opinion anyway) two days of the previous week I was keen to put a good effort in on Saturday. Actually thinking back I stated my plans for the weekend in a bid to kick myself up the arse. Not everything went to plan of course. I got to the pool to find the main one being used for waterpolo and the other by the junior squad. The rest of us relegated to a shared double width lane. I spent an hour dodging people and mostly doing easy swimming with drills. It all felt very unproductive and reminiscent of public pools back home! The day was heating up well though with a few hints of clouds in the sky. No excuses there not to get in the big ride planned. I’d made the decision to finally go and ride the Numinbah Valley. 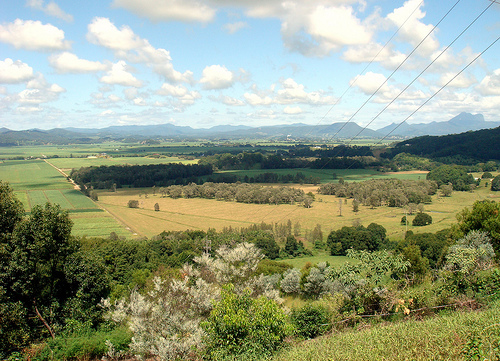 I’d ride up Springbrook and drop down into the Valley, then head South to Murwillumbah. Depending on time I’d then keep going and turn back up the coastal road. I was told Numinbah was good riding, but isolated and tough. In fact the way it had been described to me had if anything put me off. The impression was you’d be lucky to get round there unscathed! Still I’ve been here 6 months and never ridden the route. Within a few minutes of heading out I remember thinking how stiff my legs felt and how it didn’t bode well. I was determined to get some good training in though so nothing was going to alter my plans. I rode easy over to Springbrook giving me a nice hours warm up before the climb. Last week I timed the climb riding with my race wheels on. Much as I’d enjoyed riding without all the usual data being recorded it had bugged me a little not to know what the power was for the climb. So when I passed the picnic area at the start of the climb I attacked and held it to get me up to the top in 24:20. The result is I now set some new PBs in my power data! Also I was a quarter of the way through the ride and pretty stuffed. Definitely going anaerobic in the last kilometre! Repeating my tough climb in a matter of days was far too encouraging to have any consideration of shortening the ride. I dropped down into Numinbah for the first time taking it really easy on the steep descent. What I learnt is that Numinbah is not that tough, nor that isolated and in fact is a beautiful place to ride. The road is undulating with an overall rise until you drop down into the Tweed valley. It’s a little cooler in there as it’s generally more sheltered. The views of the forest and rising mountains are spectacular too. As usual I didn’t have my camera with me! In Murwillumbah I stopped off at my usual Shell Servo. It’s run by a friendly South African man who clearly never recognises me as he largely asks the same questions. Where I’m riding… If the cars bother me… I prefer it to the far more common it’s a bit hot to be out riding isn’t it? I always wonder if these people really think that once it’s over about 28C you should stay indoors? A top up of fluids and a solid intake of V was enough to pick my riding back up again. The rest of the trip whilst uneventful was at a solid pace. Net result was a 170km ride with over 2500m of climbing in a little over 6 hours. I finished the day with only a 30 minute run off this. That felt great too! I compensated for the short swim on Sunday by getting in the full 5K. Then back out on the bike for another beautiful days riding. This time taking things a little easier and even bringing along the camera! Today’s picture is one of the views over the Tweed Valley. When it comes to riding I’d say that area is more my base than the Gold Coast. Despite planning to take things easier I still threw in a climb over Tomewin and went at it hard. The weekend has given me some confidence that my time here has started to transform my riding. So now I’ve started my taper. The first thing I did was look at the planned taper and its execution for Busselton. Man, I didn’t run much, in fact I didn’t train much! In comparison to my plans the reailty was very light indeed. This time I’m aiming to stick a little closer to the plan and train a little bit more. Not that the Busso taper failed, but I think it could be better. Tapering brings a whole new set of concerns is this too much, is this too little? I’m over that general feeling of low motivation and concern about performance. If I can get to the line in Port fresh… The way I’m riding right now and the work I’ve done on my run… It might just work! Actually the biggest problem right now is letting go. It’s hard to plan workouts without trying to build at the moment. I shouldn’t be testing my fitness now, instead allowing it to level off and then giving my body time to recover. It’s so tempting though, the way I can ride… I could go out and smack a few hills for fun! Today will be my first rest day of the taper. I’m deciding that right now and sticking to it. Everyday since Saturday has had some solid training in and it’s time to let a bit of recovery happen. I shall go out and enjoy the day instead. Some long walking, maybe a trip to the cinema this afternoon! It’s still hard to make this choice – in the back of my mind I’m wondering if perhaps a short bike, or swim, or run would be appropriate! Better to be reigning myself in that struggling to do anything though. Right now I’m pretty excited. The weekend consolidated some signs that were all ready there and I was just ignoring. Once again I’m fitter than I’ve ever been. I’ve made a step up in my cycling. My run endurance is greatly improved. My swimming is strong and in a place where I think I can start to make real progress. All these things are great news with a race almost 2 weeks away. Beyond that I’m excited to test this fitness out back home on my old routes. Hell, I’ll be honest I almost wish I didn’t have a race coming up! I feel like I’m in perfect shape to really start training and to take things further. This Ironman is almost an interruption! Part of the plan is to execute a taper, race and recovery that sets me up to pick this training back up very quickly in April. With luck that’ll give me a month to play with things before Lanza!